Rascal Flatts are scheduled to play in concert at the Hard Rock Live Orlando on Monday, March 19th, 2012 to help launch the inaugural Music for Champions concert event and auction to kick off the Arnold Palmer Invitational PGA Tournament. 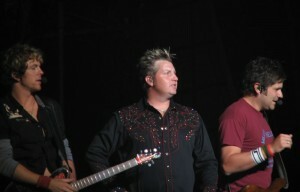 Rascal Flatts is one of the most successful country bands in the industry today whose songs have crossed-over to mainstream top-40 radio with such hits as “These Days”, “Mayberry”, “Bless the Broken Road”, “Fast Cars and Freedom”, “What Hurts the Most” ,”My Wish”, “Stand”, “Take Me There”, “Here”, “Here Comes Goodbye”, and “Why Wait” that have all reached number one on the Country Billboard charts. “What Hurts the Most” became Rascal Flatts’ first number one adult hit in the U.S., reaching #1 on the U.S. Billboard Adult Contemporary chart. Known to be able to fill up big arena’s across the Country, the Hard Rock Live show will provide fans to be up close with the band in the club-type atmosphere. The concert will benefit the Arnold Palmer Hospital for Children & the T.J. Martell Foundation. This entry was posted in Calendar and tagged concerts, country, hard rock live. Bookmark the permalink.